Book your Hog Hunt here! That’s some good eating right there! There’s currently an estimated population in excess of 1.5 million hogs in Texas, and that population is growing daily. The Texas hog population is basically exploding and there’s hogs all over the state. If there are any countries in Texas that don’t have hogs, and that’s a big if, it won’t be long until they do have hogs. Female hogs, or sows, can begin having babies as early as 6 months old and they can have a litter every 3 months, 3 weeks and 3 days. 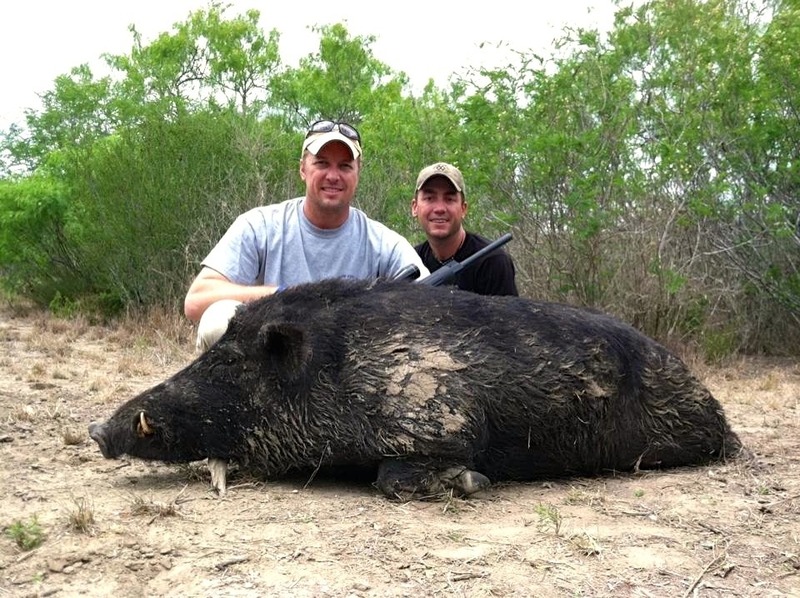 There’s no closed season for hog hunting in Texas (I would avoid hog hunting from mid-May through mid-September because it’s just way too hot in Texas), but the best time for hog hunting in Texas is mid-January through March. This is after we have been feeding for several months of deer season and before it starts to get too hot. Hogs are also a great trophy animal to add to any other hunt. With no closed season for hog hunting in Texas these are great off season hunts for a group of buddies looking to have a little fun or extend their hunting season. Hog hunts are also a great way to introduce kids or the novice hunter to the sport of hunting. Hogs were first introduced in Texas by Spanish explorers over 300 years ago. 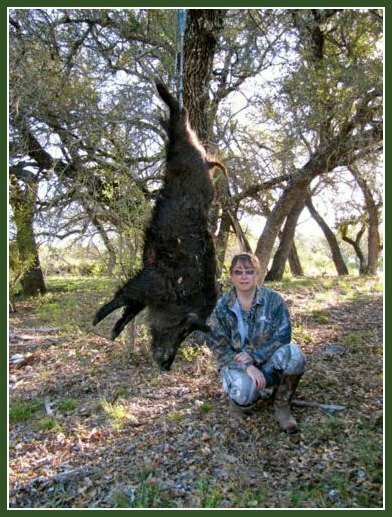 In the 1930s European wild hogs, “Russian boars”, were introduced into Texas by landowners and sportsmen for hunting. 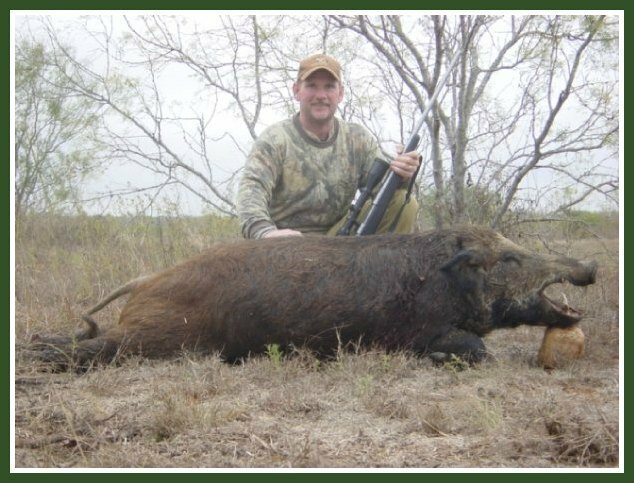 The hogs we hunt in Texas today are a mix of Russian boars and the hogs introduced by Spanish explorers and are also referred to as “feral hogs.” Feral hogs are typically black in color, but all different color variations can occur. A mature hog can reach 36″ at the shoulder and weigh as much as 400 lbs. Hogs are omnivorous and their diet will vary depending on seasonal availability. With very few natural predators and the sows ability to have a litter every 3 months, 3 weeks and 3 days hogs have quickly become one of, if not the largest, nuisance animals this country has ever seen. We typically hunt hogs the same way we hunt whitetail deer, which is out of a blind overlooking several senderos (cleared roadways) in the brush. Depending on whether you are bow hunting or rifle hunting the type of blind and proximity to the feeder will vary. If you want to hunt hogs with a rifle you will typically be in a tower blind about 100 yards from a feeder and if you want to bow hunt for hogs you will typically be sitting in a ground blind about 20 yards from the feeder. We sometimes spot and stalk for hogs, as well as hunt safari style out of a vehicle (typically a top drive), but the majority of my hogs hunts are done out of blinds. Since hogs have pretty poor eyesight a lot of camo isn’t necessary when hunting them. I typically just wear jeans, snake boots (to keep the cactus and thorns/brush off my legs) and a camo shirt. With no closed season for hog hunting in Texas the weather with vary greatly depending on the region and time of year we will be hunting. If you are coming on a hog hunt it’s probably best to just call me and find out what the weather has been like and what it’s forecast to be and pack accordingly. 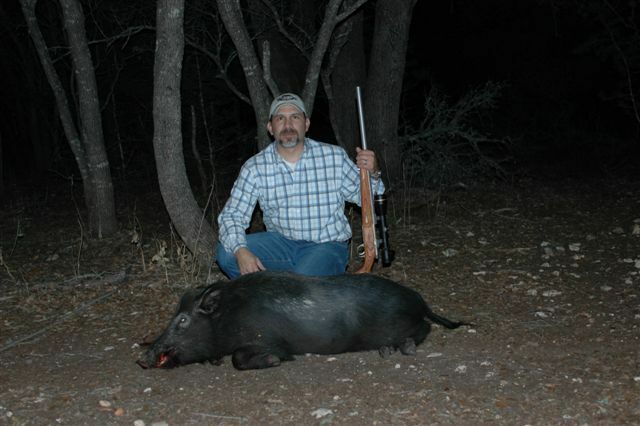 Hogs can be hunted all over Texas but I run the majority of my hog hunts in South Texas and the Texas Hill Country. We occasionally run into hogs out in West Texas while we are out hunting aoudad or elk, and you are more than welcome to hunt them in West Texas as long as we have any extra days while on your aoudad or elk hunt, but I typically book my specific hog hunts for South Texas or the Texas Hill Country. 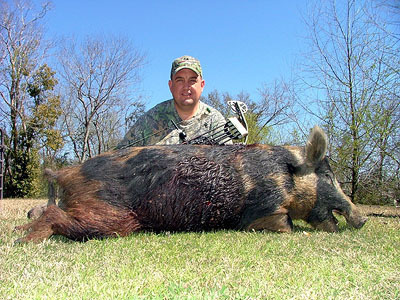 If you would like to read my some of my previous Hog Hunting in Texas blog posts, click here.